The Supreme Court closely scrutinizes policies involving racial, sexual, and other "suspect" classifications. But unlike almost every other classification imaginable, marriage laws use a criterion necessarily linked to an inherently good social purpose that we didn't just invent. This criterion isn't truly suspect and shouldn't get heightened scrutiny. The primary question regarding the definition of marriage is not whether any particular class of individuals (gay, straight, male, female) has a special link to the common good, but whether certain couples do. And it shifts the burden of proof onto those who would find no such link. Girgis, by the way, is one of Robby George's creatures. I cannot tell if he was infected directly or through Ryan Anderson and it does not matter. Suffice it to say that Girgis now exists to serve ultra-orthodox Catholicism. But I digress. There are a number of things that Girgis misses. The first of these is that the Supreme Court is not concerned with marriage laws directly. As Justice Kennedy pointed out in United States v. Windsor states are responsible for regulating marriage and may do so providing that they do not interfere with the constitutional rights of their citizens. Therefore, the Supreme Court is only interested in an analytical subset. The lower courts have narrowed the focus even further to issues associated with the Due Process and Equal Protection clauses of the 14th Amendment. Girgis claims that marriage laws use a criterion necessarily linked to an inherently good social purpose that we didn't just invent. Actually they did invent it. While unstated in this quote, their contention is that the purpose of marriage is procreation. This is what they have insisted in every brief that they and their allies have submitted and virtually every court has dismissed it as an argument that is hardly worthy of consideration. It's a definition of marriage that Justice Kennedy never addresses in Windsor; presumably because it is frivolous. Alito makes the argument in dissent but a majority of the Court has seemingly ruled that marriage is not for the purposes of procreation. By depriving gay couples the right to marry, are they and their children denied due process or equal protection? 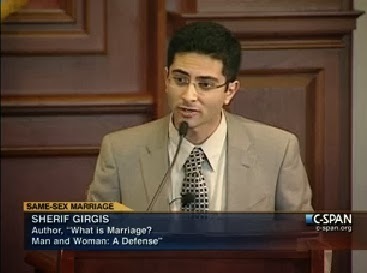 Girgis should consider that fewer than four justices agreed to hear the pending marriage cases. Putting it another way, to deny certiorari to the seven marriage cases, at least six of the nine justices had to (in essence) consent. The Court could have left those cases pending until a competing opinion was reached by another circuit. That would have left the stays in place. At least six of the justices allowed marriages to proceed. Has the Court already telegraphed it's judgment in the matter? 1It is worth noting that a Second Circuit panel found that gays constitute a quasi-suspect class deserving intermediate scrutiny. A Ninth Circuit panel, considering the unrelated Smith Kline case ruled unanimously that, based on Windsor, distinctions relating to sexual orientation are subjected to heightened scrutiny.